You might also read our best cold weather bat recommendations, which fall along these lines. The catch with the best fall ball bat is we consider fall a transition period for most players as well as, potentially, a cold weather bat. In our minds, hefty composites still make a lot of sense as well as an aluminum bat, get this, a well weighted wood bat too. Although many options to consider based on the league, we think the best fall ball bat is the drop 5 DeMarini Voodoo. Our introduction to the 2017 DeMarini Voodoo Balanced was love at first sight. We’ve long been enamored with the two piece hybrid design that DeMarini pioneered, but believed it out of many players’ realm in a heavy swinging bat. But a new alloy design for 2017 finally gives us a lighter swinging version of the bat that started the hybrid craze. The aluminum barrel is perfect for fall baseball, and its somewhat heavier swing than the DeMarini Zen, or other two piece composite bats, facilitates some strength training for fall ball.It is far and away, our favorite choice for fall ball—especially for those in cold weather states. It fits well, too, in our Best BBCOR bats page. For much the same reason we like the Voodoo Balanced, the Z-Core Hybrid’s aluminum barrel and focus on a more balanced swing, fit in the wheel house of many fall ball players. It will work in cold weather, and give top shelf performance from a well known brand. Although very early in the USABat world, the 2018 Easton Beast X Hybrid is our favorite cold weather USABat. We like the big barrel, multiple drop options and the durable aluminum. The two piece design should help dampen sting for those cold days where an endcap hit might send your thumb to the hospital. We should also note, this bat is not technically required until January 1st of 2018. If you’d like a wood bat to swing in fall ball—specifically for strength training and a focus on good mechanics—the composite wood Baum Bat is a must have. It is nearly unbreakable and has great performance. Unfortunately, it is not an inexpensive bat, but you’ll only need to buy one for your entire life anyway, as it won’t break like other wood bats. We have a full article on the best composite wood bats that may be worth your time. We think any of those would work quite well in cold weather. If you are an avid reader of our site, you know what is about to come next. It is our disclaimer in terms of claiming the ‘best’ bat. We heavily caution, the ‘best’ bat for everyone else might not be the best bat for you. We suggest you consider the opinion above, read our review of the bat in detail, and then make an informed decision. In large measure, bat fitting is a function of taste and preference over science and popularity. With that said, we have objectivity in deciding the best fall baseball bat. For starters, we have hit extensively with every bat in the performance space since 2014. On this very blog we have documented those efforts. Our YouTube page shows just a small glimpse into our due diligence. We’ve also spent a considerable amount of time discussing bat production and performance with bat manufacturers and major vendors. Additionally, we have meticulously gathered reviews from players across the country and their direct feedback on these, and many other, bats. Information gathered in our now thousands of hours of reviewing and writing, gives us confidence in selecting a best fall baseball bat. Do You need a Fall Ball Bat? If your growth spurt justifies it. 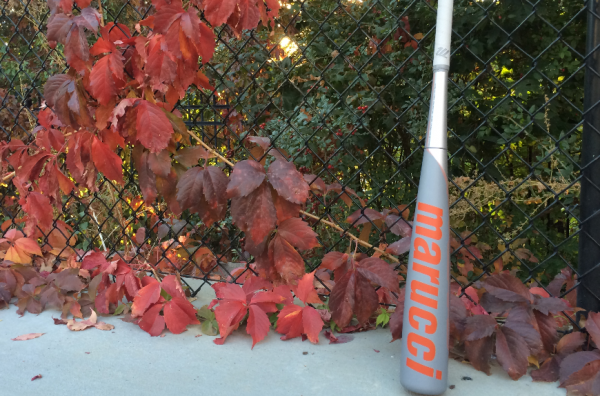 Few things will make your upcoming spring ball season more painful than swinging with too light a bat this fall. Players who have grown a lot since the spring may have maxed out their bat speed with their current bat as fall arrives. To avoid making the kind of considerable jump in weight that makes hitting more difficult than it already is as next spring comes, you might want a transition bat in the fall. If you use fall ball for strength training more than for filling up the stat sheet. Many players approach fall ball as a way to get in some quality reps and build muscle in time for the spring when baseball tends to be more competitive. If this is your plan, consider a heavy bat (or even a wood one) to produce stronger at bats come the spring. If it gets cold where you live, playing with a composite barrel is not recommended. Composite barrels are not good for cold weather. They are infamous for breaking. Most manufacturers suggest weather 60+ degrees. If your fall season puts you on the field in sub 60 degree weather, you should really consider getting an aluminum barreled bat for the fall. As we mention above, the ‘best bat’ for any given hitter may very well not be the best bat for the next. As such, consider all the information when you see lists like the ones we’ve made above. After thousands of hours of research, hitting, reading and writing, we are confident the above are good choices for the best fall ball baseball bat, especially if your focus is on good strength training, a transition bat into something heavier next spring and durability for cold weather play.